Matcha Green Tea + Hyaluronic Acid + Resurrection Plant (Rose of Jericho) | Hydrating Eye Gel | Acne Safe Eye Gel | This is a super-hydrating eye gel. Your skin requires a balance of oil and water to stay supple and healthy. This skin-drenching combination of Aloe + Hyaluronic Acid + Rose of Jericho Extract work together to deeply hydrate delicate eye area without clogging pores or causing irritation. No artificial crap, no sneaky fake stuff in the ingredient deck, just pure plumping + cooling goodness! This is made for all ages and all skin types. You can also use this on smile lines and then seal in with an oil-based serum. Epic alone with the COFFEE + PRIMROSE Eye Serum. Best of all, if you are acne-prone, you don't have to worry about this clogging your pores an can use this with confidence. Skin is skin, no matter your age, your eye skin needs hydration. If you see little lines creeping up around the corners of your eyes, drink more water, and add this into your routine. This plays well with others, while I do think it is best to use only natural products, you can add this eye gel to any routine you are already using. Always apply water-based products to cleansed + toned skin, before any oils or oil-based serums. ★Hyaluronic Acid draws moisture into your cells + plumps + firms + increases elasticity! This is currently my only eye gel, directly formulated for the eye area. While you can safely use many of my Pure Hydrating Face Waters and gels around the eye area, this is specifically made to hydrate the delicate eye area. This is intended to be used along with a thicker or oil-based cream. Sealing the Hydration in with a cream like Bright Soul Eye Butter or De-Puff Eye Butter will ensure lasting and improved results. ◆Organic Aloe Vera base enhanced with Hyaluronic Acid penetrates deeply to hydrate the deepest layers of your skin. ◆Dries quickly and doesn't leave a sticky residue! ◆Safe for use on entire eye area. ★Aloe Vera Gel offers true hydration to thirsty skin. Rich in plant sugars that help to hydrate and soothe skin, it also has a gentle cooling effect. Unlike commercial Aloe Vera Gel, I use an Unpreserved (no Sodium Benzoate) Organic Aloe Vera Gel. This assures that you are not only getting all the benefits of pure aloe, but no nasties. ★Rose of Jericho (The Resurrection Plant) is one of the stars of this formula. It helps your skin to not only absorb moisture, but helps maintain moisture levels throughout the day. ★Organic Helichrysum Hydrosol helps to speed cell regeneration, soothe, reduce redness, improve texture, reduce the appearance of dark circles and reduce signs of aging. ★Organic Witch Hazel has a ton of anti-inflammatory and skin tightening capabilities. ★Organic Coconut Water provides deep hydration + electrolytes + potassium + magnesium. ★Organic Matcha Green Tea offers antioxidant protection and increases circulation. ★Organic Licorice Root helps improve the appearance of tone and texture. ★Hyaluronic Acid draws moisture into your cells + plumps + firms + increases elasticity + is great for all skin types. Hyaluronic Acid is naturally occurring in the human body, found in places like joints and skin. It is a polysaccharide, related to sugar. I use a mixture of three molecular weights. ★Pomegranate provide an instant lift. 6 months - can be stored cold, but must be stored out of direct sunlight. Roll under eyes if you have the roller and gently pat in. I apply this twice a day. It is the first step of your eye routine, and you can apply your eye serum and then de-puff eye butter. You always want to apply products from thinnest to thickest when it comes to skincare. Taking good care of your eyes does not have to be complicated. My eye products are made for all ages and help reduce signs of aging as well as prevent them. Apply a drop of the eye gel under each eye. 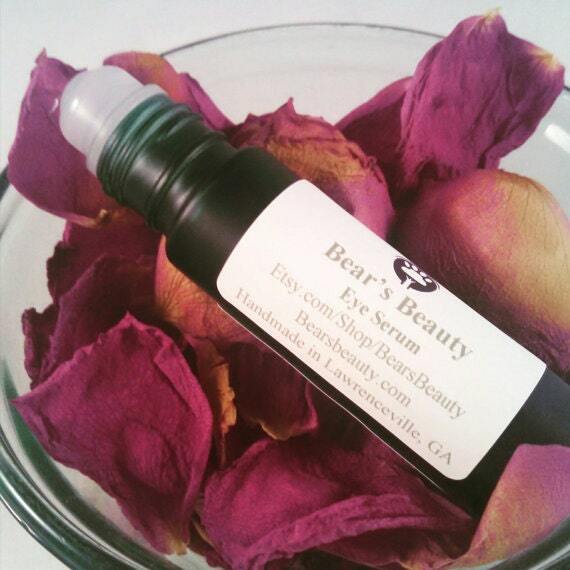 Apply one drop of Anti-Aging Under Eye Serum to each eye and pat gently. Apply De-Puff Eye Butter and allow to sit 3-5 minutes, remove any excess gently with tissue. Removed eye makeup with Eyelash Enhancing Eye Makeup Remover. Apply a drop of Eye Gel under each eye. Apply Bright Soul Eye Butter under and around entire eye.